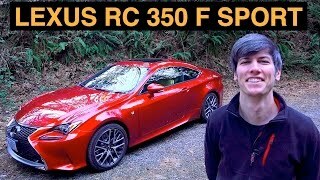 Though the design language of Lexus RC 350 2015 is similar to recently released IS Sedan, but Lexus has taken it a lap ahead with its sporty looks. At the very first glance you’ll find yourself glued to its fabulous exterior, smart interior and engine it brings with it. This sedan from the house of Lexus holds everything that can make it irresistible. Keep scrolling to have a descriptive knowledge of this new member, Lexus RC 350 2015. For the interior of Lexus RC 350 2015 company has specially introduced a lightning package which gives its interior sporty look by reflecting the upwards rather than downward. Lexus has also combined shimamoku wood highlights with its new tone called Clove, which together with the former proves to be a perfect amalgamation giving in-turn a touch of luxury to already sustaining sporty interior. Lexus through its cockpit has distributed the functions under two houses; upper part which constitutes seven inch navigation screen and instrument panel while the lower house brings a layered center console featuring Remote Touch Interface. Entire interior of Lexus RC 350 2015 is clean with its arrangements. Last but another sight of attraction is a clock that finds its house between navigation screen and audio system. 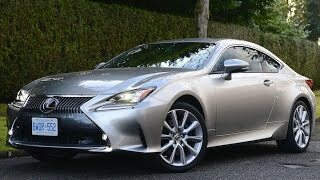 Exterior of Lexus RC 350 2015 is a classy touch to aggression with its lower fascia portraying a low and wide grille located amidst triangular headlights which display ‘L’ shape with low beam on. Carrying the exterior all the way through are 10 Spoke 19” aluminum wheels with an option to go for five-spoke 18” also. 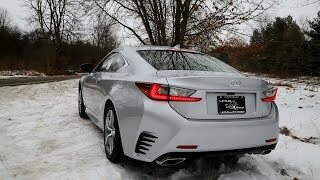 Moving towards rear fascia of Lexus RC 350 you’ll notice an intense touch of aggression through the gorgeous tail lights and air outlets located on both the sides of car. In all Just like interior, exterior of Lexus RC 350 is classic amalgamation of sportiness and luxury. Lexus RC 350 2015 gets its power through a 3.5 Liter V6 engine that delivers a total output of 306 hp and peak torque of 375 nm. Engine is paired to an eight-speed automatic transmission. Hearing it from company, the automatic gearbox helps Lexus RC 350 in delivering performance oriented economic ride and also could be upshifts in just 0.2 seconds with driver putting it on manual mode.